WHY DOES YOUR ORGANISATION NEED FIRE WARDEN TRAINING? Because in the event of a fire, trained FIRE WARDENS (or 'Fire Marshalls' as they are sometimes known) are CRITICAL to saving lives!!! A Fire Warden's role is absolutely critical in ensuring the safe evacuation of your staff in the event of a fire.Where real fires have occurred in businesses there are many cases where fire wardens have been the heroes of the day. Fire Wardens not only need to keep a calm head in an emergency but also need to carry out their duties effectively under pressure.The Fire Wardens Training Course is the perfect course to ensure Fire Wardens reach that goal! The Health and Safety Group also provide a number of fire safety products and services for fire wardens including fire safety risk assessments, fire safety DVDS, fire extinguishers, fire blankets, smoke alarms fire safety log books and fire safety signs. Fire safety Awareness Courses include are available for staff. These teach how to reduce fire risks, deal with fires if appropriate and escape safely in the event of fire. The Fire Safety Order requires that fire safety training is provided to staff when they commence employment and that refresher fire safety training is provided on a regular basis. 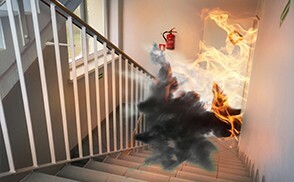 Fire is often the biggest business safety risk and without fire safety training, business insurances may not be valid. Fire Safety Training also saves lives! This activity has been accredited by The CPD Standards Office and equates to 3.5 hours of CPD.